Introducing an imperishable selection of large plastic sheds designed to better organise storage by incorporating wide-ranging access centred along their length. Mucky gardening gear to one side, patio furniture the other. Alongside providing centred access & organised space, these resin manufactures constitute all round weather-protection whilst their designs promptly repel rainwater. Inside’s elevated to overcome bending, freshness circulates assisting humidity, their muscular beefy floors are built-in meanwhile a leisurely light pressure wash soon restores their looks. The four storage facilities making up this selection expand from 10 feet in length up to 15 feet. 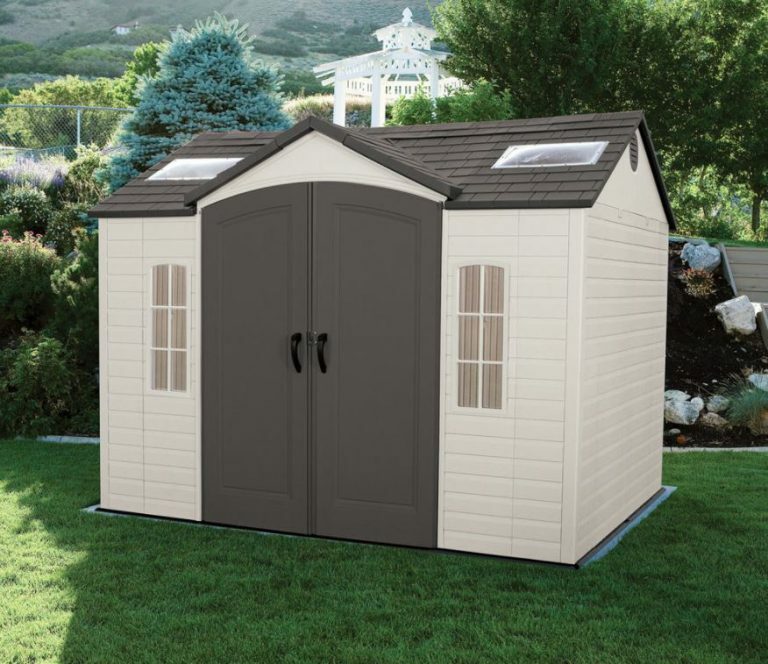 In the UK, garden shed planning regulations are pretty fair & rather free compared with some states in America however I would still check the dimensions of the 15 footer with the authorities wherever your location is in order to acquire confirmation prior to decision making. Although the largest style lights our candle, providing more than adequate proportions to accommodate all our outdoorsy gear, the length would dominate the garden width due to our mid-townhouse position. I’m sure planning laws & some neighbours may frown if this were constructed, therefore choosing the size requires thoughtful consideration. Lifetime’s cutting edge design portrays trendsetting architecture exhibiting a stylish ‘easy on the eyes’ neutral complexion, radiating the tones of desert-sand. Squared-effect widows comprising an arched top present either side of the centred twin doors; resembling a picturesque mini-house, a stroll across the garden. In the main, the most singled-out & favoured roof design equates to an apex, fulfilling desires of rapidly draining rainfall. Lifetime roofs are angled high and stretch out beyond the walls, surmounting internal leaks & returning ample headroom. Incorporating doors along the length results in the lowest point of entry with regards to headroom access. Overcoming this objective, an additional apex add-on covers the doors entrance, elevating headroom to prevent cracking your noggin, albeit this does complicate assembly a tad. The merits beholden to Lifetime’s length-ways entry design aids to effectively organise storage into large separated sections. For instance, 8 feet in depth enables storing household tools and necessities at the back of the shed in-front of the walkway-in, the left-hand side could designate a clean area for patio furniture leaving the right-hand side accommodating mucky gardening equipment and the lawnmower. It’s rather a well thought out design compared to conventional width entrances. High Density Polyethylene (HDPE) constitutes Lifetime’s composition. Besides being eco-friendly reusable, non of the ingredients making up this manufacture are harmful to the environment, neither do they release damaging toxins into the ground. Furthermore polyethylene has long-term immunity from decomposition no matter what climatic conditions it suffers. Unlike the rotting demise wood succumbs to when rainwater penetrates the grain, polyethylene continues-on impermeable & unresponsive, resisting any type of decay breakdown. Polyethylene isn’t designed for painting therefore sidesteps decorating meanwhile conquering colour-fade & fracture issues assailed upon by sunburn exposure, the resin is stabilised with a guard of UV protection, armouring the composition. Putting an end to dents & chips appearing after suffering knocks, Lifetime’s chunky make-up is composed of two reinforced sheets combined together. 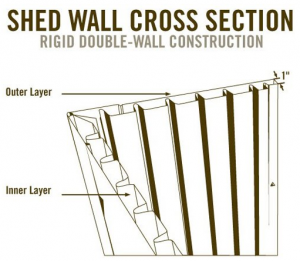 The inner section comprises reinforced ridges whilst a wooden simulation creates the outer-skin. Polyethylene delivers weather-resistant defence for protection against damp, driving rain, lumps of snowfall, scorching sun & clammy conditions. Freshening up Lifetime’s immaculateness entails a mild pressure-wash. 10 minutes and you’re done. What ended up as maintenance frustrations for our concerns has transpired into an occasional leisurely cleaning duty. Lifetime fascia is molded to realistically mimic the arrangement of a wood panelled construction embodying textured grain. Subject to garden settings, mossy dirt may become lodged within these crevices and require shifting with warm water, a supple brush & a squirt of detergent. Bolstering support to stabilise an 8 feet roof-span is pivotal for accommodating weighty snowfall, Lifetime deliver the solution. Three steel joists extend across the breadth of the 10 footer to reinforce the apex structure whereas the 15 ft sheds accommodate five. 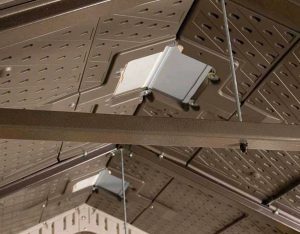 Powder-coated to withstand rust, each truss secures to the steel infrastructure to which the roof sheets fasten to. A multi-skinned lining of imperishable polyethylene constitutes the roof make-up meantime molded to resemble conventional rooftop tiling and shaded slate-grey. The roof structures are formed into apex constructions comprising additional apex add-ons over the entrances for the purpose of incorporating the high arch double doors and increased walk-in height. In contrast to a traditional felted roof common to wooden garden sheds, a polyethylene make-up is not susceptible to disintegration nor replacements, therefore Lifetime’s escape the breakdown of decomposing roofing felt not forgetting the frequent frustrations reinstating a new one. Large and small skylights accompany the windows to illumine daylight to the interior however unlike glass, their transparent polycarbonate manufacture doesn’t shatter and cause accidents. Resolving the predicament of clammy environments causing sweat & condensation, integrated ventilation grids face each other either side of the apex peaks to effectuate a steady stream of outside freshness to constantly disperse the internals. Connecting to the boundary edge of the floor, the wall panels snap into position delivering encasement from outside. This enclosure seals base gaps providing a blockage to rainwater, leaves & pests gaining entry; a feature we find super efficient in maintaining debris-free internals. 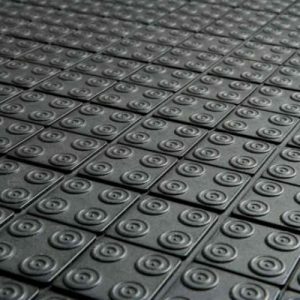 The flooring comprises a muscular thickset polyethylene manufacture buttressed with supplementary strengthening to subsist tractor stresses, furthermore it’s anti-slip textured surface delivers the grip whilst formulated to withstand stains derived from solvent leaks, purposely designed for a quick wipe-up. In order to enhance the floor’s lifespan to endure the burdensome forces of tractor mowers, the prerequisite prior to construction regards laying a levelled substructure of asphalt, concrete, paving or wood to accomplish solidity below and to attain firm anchorage. The resin floor panels covering the base expanse interlink with each other however it’s vitally important to ensure the flooring is turned the right way round when constructing the dual-entry sheds. This common mistake ends up with frustrations during installing the doors. A heart sinking feeling when you discover it’s the wrong way round towards the end of constructing, only to start dismantling. Extensive access is catered for regarding one or two sets of double door entry systems. Driving-in a tractor mower is aided by the broadness of the doors which open right back along with the sloping threshold purposely engineered to assist wheeling in. Similarly, the fascias weatherproof creation constitutes the door manufacture albeit tinted brown yet equally assures freedom from decay not forgetting the untroublesome duty to clean. 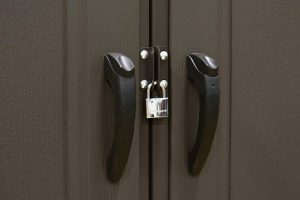 Locking both doors simultaneously is conducted through a padlock fastener, man-grip handles operate the latch via their push-button top, door length hinge-pins function the doors swing whilst internal through-bolt latches deliver a wind-saver, keeping the left door closed. Opting for two sets of twin door access is presently Lifetime’s benchmark, a feature seldom seen elsewhere comprising a plastic manufacture however both the 10 and 15 ft models are popular purchases and a favoured choice for those wishing to separate storage with independent access. Construction-wise, they do generate more assembly headaches than the facilities comprising a single pair of doors. Like most things in life, some struggle where others accomplish assembly without a hitch. Primary focus preceding construction is to lay a sub-structure of solid foundations as stated in the floor section up-above. Priority is to ensure the base is completely level to accomplish a perpendicular construction and avert a lopsided shed. If you’re out of alignment, the doors function will not be true and lining up the panels will probably present issues. An additional necessity as with any shed, is to raise the foundations above a floodplain level. Get this first step right and you’re trucking towards a perfect long-term construction. Assembly involves implementing the sequence of steps demonstrated in the instructions. 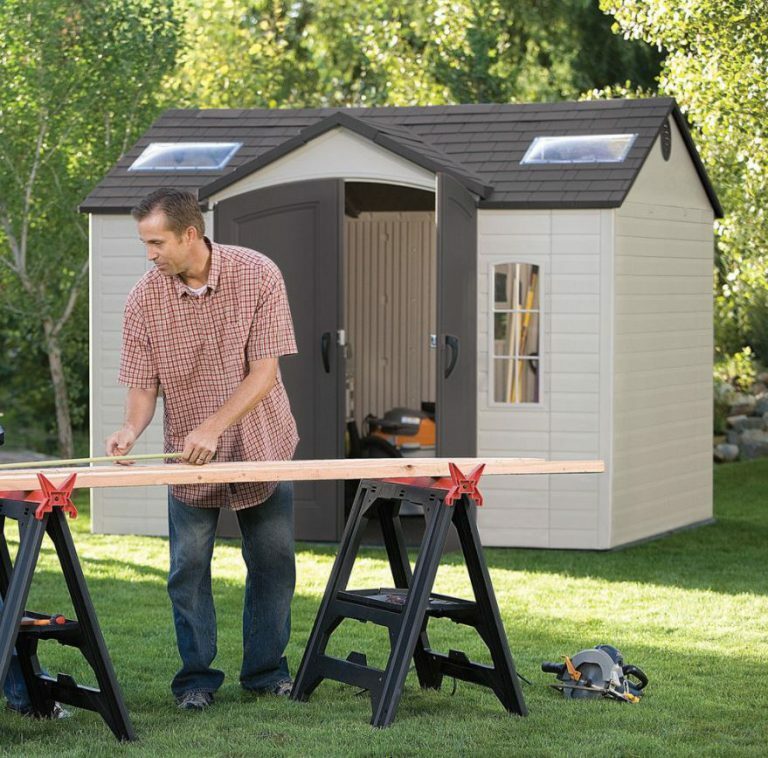 The larger the shed, the more time construction takes, most of us are DIY novices at the end of the day where shed building’s concerned. 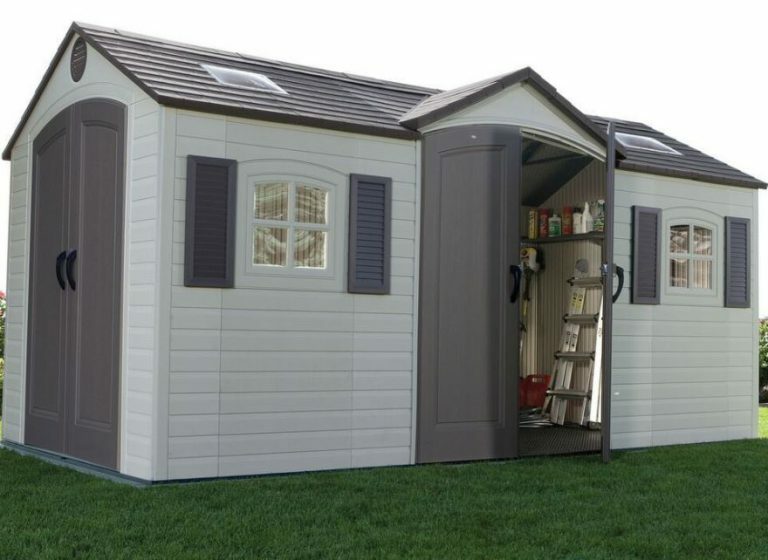 You’ll have to scroll all the way down the Shed Sizes page to check out Lifetime’s large shed competition, however, here’s one competing shed:. My-Shed, born out of Oakland’s collection of garden sheds showcases a charmed rustic appearance, designed for utility or summerhouse accommodation. Uplifting the resin boundaries, DUOTECH™ engineering delivers a fully customise-able composition with options to jigsaw, drill into the fascia to install electrics and secure shelving & hooks to enable hanging gardening tools. Furthermore, this unique resin talc manufacture is paint-able with acrylic emulsion therefore enables brightening-up the home-yard in personal colour schemes. 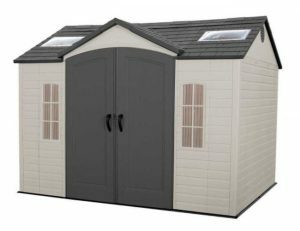 My-Shed centralises a pair of twin doors across the 11 feet length whilst the depth spans 7½ feet. Lifetime deliver weather-resistance, durability and easy-to-clean grand architectures accommodating windows either side of twin doors positioned centrally across their lengths. Available in 10 and 15 ft lengths, both models offer a dual entry option. Centred access aids to better organise storage into sections as opposed to doors presented across the width. A thoughtful design, assisting storing mucky gardening gear with clean patio furniture. Assembly frustrations have occurred on the dual entry systems, with regards to placing the floor the wrong way round which has knocked the odd star off reviews. Let’s hope Lifetime deliver clearer instructions regarding this issue. 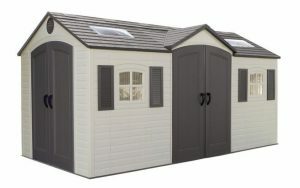 Thanks for checking out Lifetime’s large plastic sheds. Share your favourite roomy storage solution below, along with any Lifetime queries. Please share Lifetime’s spacious sheds. Thank you. Having sheds are so great and it would be great if every home had one. I have one but it is not plastic but made of wood. I believe having a shade is pretty awesome because there are so many things you can store in them in fact as I am reviewing your post we have so many things from building supplies and tools and a few other stuff. Having a shed is a must. Hi Norman, thanks for calling in & leaving your message regarding the advantages of having a garden shed to shelter away all our outdoorsy belongings. We used to have a wooden one like you but unfortunately it just couldn’t survive the weather stresses. We must have rebuilt the shed over the time we had it in relation to the amount of decayed panels we replaced not forgetting periodically fitting new roofing felt once disintegration had set in. Over the years, it ended up rickety through rotting away. 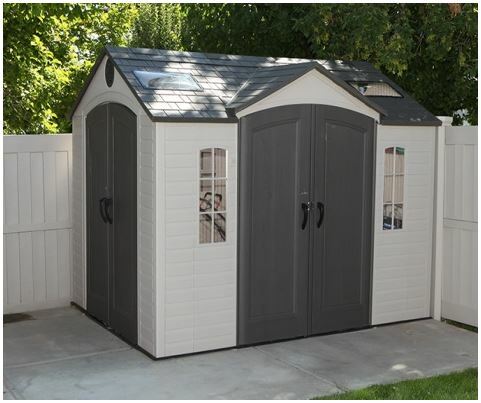 We decided to cut the hassles and find a solution that didn’t entail future conserving, opting for resin instead, albeit smaller than these sheds described here. Nowadays, maintenance involves a sporadic jet was with the hosepipe & that’s it. 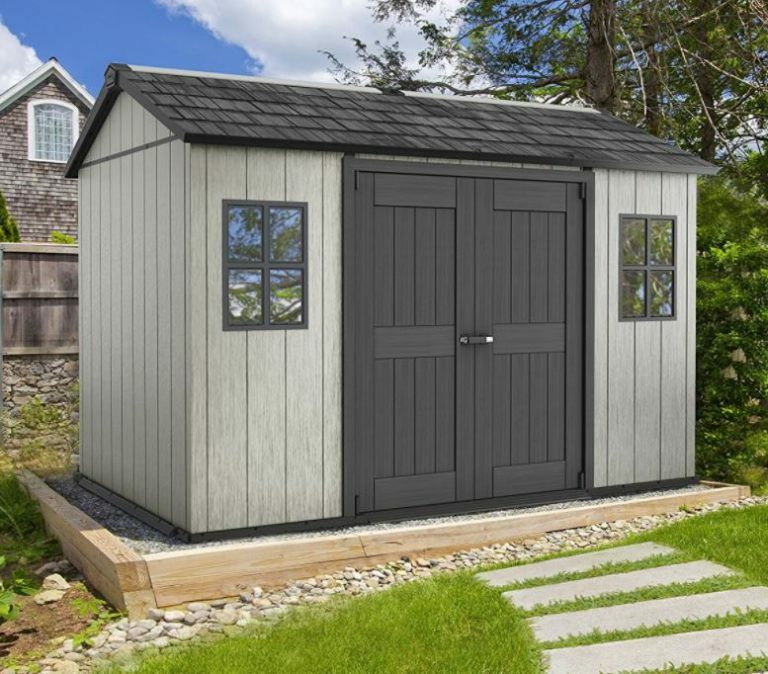 Like you, we use a storage shed to accommodate all our gardening tools, barbecue gear & outdoor accessories alongside outside furniture once winter sets in, they’re so convenient. I checked the prices of the sheds here, and considering they will do you for life with pretty much zero maintenance, I was very impressed. Great invention to make sheds in plastic because they are not going to wither – makes sense. The wooden sheds are great too but they break your heart when they begin to rot. Don’t suppose those plastic sheds have plastic hinges for the doors? I love how they come in different colors as well. May we order one and have them painted to our spec? Even better I seen a plastic shed for only $51 to house your motor cycle – pretty genius. 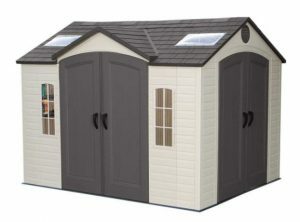 I may invest in one of these large plastic sheds because I have a lawmower, gardening tools for growing my foods along with 100s of pots and containers. Just Stuff! That really needs to be organized into one place for ease to find and keep safe and protect against the weather. I was reading that they have to be level and I thought “oh know” – my garden is a bit bumpy. But I see you give instructions on how to solve that as well. So, problem averted. Once its up its up for life. OK Simon, I am having another look and see if I can decide on one. Wish me luck and thanks again for this very informative and article on large plastic sheds. 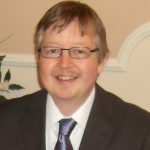 Hi Philip, thanks for stopping by to investigate Lifetime’s spacious storehouses incorporating doors across their length as opposed to the conventional width-way access associated with garden sheds. I’m a huge fan of wooden structures and furniture but after the annual conservation dilemmas our previous wooden hut put us through, we decided to make life easier by exchanging for resin. Performing the occasional hosepipe shower to freshen the new look delivers so much convenience for our sakes. 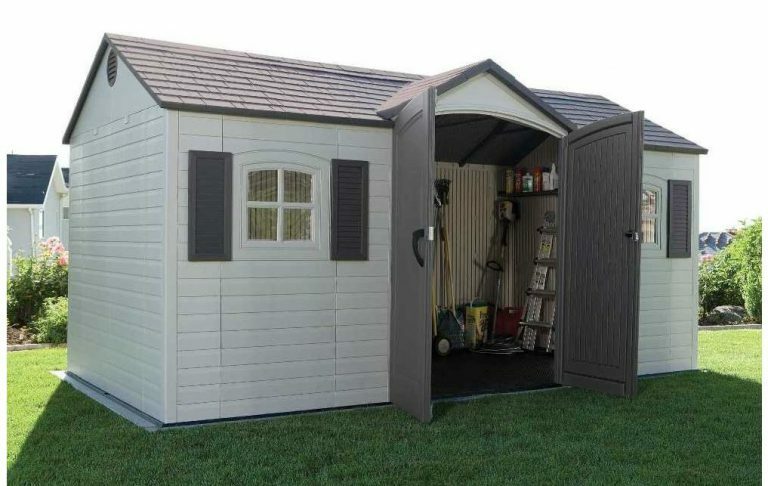 My preferred garden shed would constitute low-maintenance cedar wood capped off with a resin roof, molded to represent slate tiling however although I have seen them for sale locally and they do look superb, they are very expensive. You question whether Lifetime sheds incorporate plastic hinges. Instead of individual hinges, they install steel hing pins running the full length of the door. One end inserts into the floor part of the door architrave, the other into the top part which is held into position by the roof weight, resulting in a robust swivel operation when accessing. Lifetime sheds are not designed for painting. 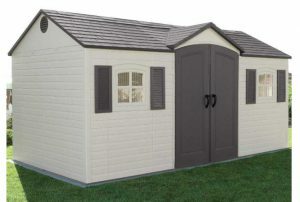 If you prefer to decorate the shed in your chosen colours, Duotech’s My-Shed (as represented up above) is the only resin shed I have come across that is specifically configured for painting, virtue of incorporating resin talc with polypropylene, conducing a composition that adheres to acrylic emulsion. We find a shed’s convenience accomplishes clearing the home-yard, organises all your outdoorsy equipment into one place where you need it most, outside; meanwhile the doddle of a wash to freshen up appearances constitutes a swift spray with the hosepipe for our concerns, we simply click-in the shower adaptor and turn the jet to high pressure and it’s done in a jiffy. Priority for any shed, particularly resin manufactures that incorporate a floor is to construct from sold level & flat ground. Accomplish this before you start and you’ll find the panels easily align into a perpendicular structure that functions precise door swings and a floor that can cope with the tensions of driving in a tractor mower along with attaining rigidly anchoring the shed, after which Lifetime should live up to it’s name – great name by the way! I love the large shed. My concern would be some of the cons you listed. Making sure that the ground is solid, and here is Florida, that can be an issue for sure. 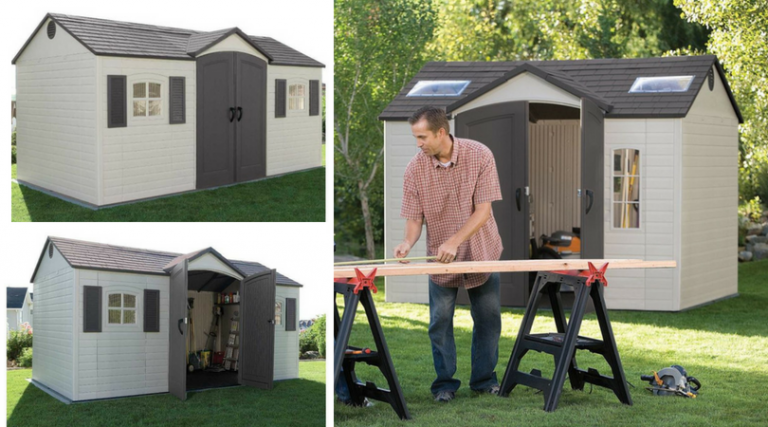 Also, I love the dual entry, but it would be just me putting it together, and I worry about getting it right 🙂 I clicked on the duotech my-shed, and I really like that one. One thing that I like is that I can paint it to customize it and match the color of my home. It still seems plenty big to store all of my outside garden tools in, along with the mower. I like the fact that it comes with a plastic base shed foundation that I can even pour concrete into. Great shed! The spacious storage and service accommodation presented with this single entry 15 footer along with Lifetime’s classic looks and stylish design certainly sparked my attention too however unfortunately for our slim back-garden these lengthy dimension are too big and therefore not suited to planners nor neighbours in our view. To be honest, no matter what style of shed is chosen, be it wood, metal or plastic – sold level foundations are a necessity to accomplish longevity for demanding services, the correct stance and anchorage. Placing the flooring the right way round has been a big issue for a few regarding the construction of the dual entry sheds. It took one builder overnight studying the plans to realise the problem why the doors were not fitting correctly. He decided to write a thorough review due to many others facing the same issues because once he dismantled and constructed the right way round everything fit into place like a glove. Yeah, don’t the Duotech sheds look fab. Being fully customise-able enables delivering a splash of paint to enhance the accents of home-yard surroundings or make a personal statement in your colour shade however I like the rustic charm it currently exhibits, everyone is different but the beauty is: it caters for change. 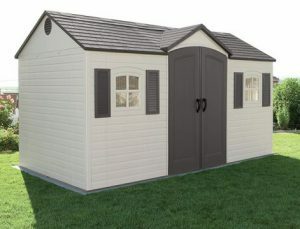 11 x 7.5 feet deliver fair size dimensions to accommodate a whole plethora of outside gear however once again the recommendations are to construct the advised foundations as mentioned here to correctly ground the shed. No foundations or bases are provided, the material used is down to choice and has to be prepared prior to constructing. Levelled foundations can be constructed from wood, concrete, asphalt or paving. Just make sure they are prepared above a floodplain.